There are two types of thermal printing methods: direct thermal and thermal transfer. Each method uses a print head which applies heat to the label surface. Thermal transfer printing uses a ribbon to produce a hard wearing, long lasting image on a large variety of label materials. 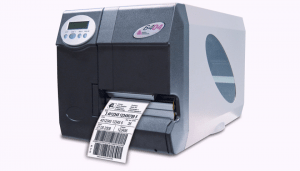 Direct thermal printing has no ribbon using thermal material which is heat sensitive. Unfortunately this material is also sensitive to light, heat and scuffs which in turn reduces the life of the printed label. Sessions UK can supply low budget flat head printers to high speed near edge printers along with external unwinds and rewinds for complete reel to reel printing process. The right printer plus Sessions labels and ribbons make us a one-stop shop. Our printers come with software to create your own label and installation with basic software training is included in our package deals.